Much like The Simpsons, Family Guy and dozens of other 20th Century Fox properties, the Ice Age film series is one that’s still around despite more than outstaying its welcome. The first was a major box office and critical success back in 2002, even earning an Oscar nomination for Best Animated Feature – to date the only nomination of such for Blue Sky Studios – and the second, while not as strong, still had plenty of heart to spare, and was yet another financial hit. But then from the third film onwards, including the rubbish fourth one, the quality took a serious nose-dive and settled into a realm of bland and forgettable kids’ tropes, something that not even its continuing box office satisfaction could fully mask. Sadly, the series remains at this low point with its fifth entry, subtitled Collision Course, which should spell out once and for all that if there was ever a time for this series to become extinct, it should be now. If you are at all still following the adventures of these characters, you’ll know by now that Manny the mammoth (Ray Romano), Sid the sloth (John Leguizamo) and Diego the sabre-toothed tiger (Denis Leary) have each settled into roles that position them as archetypes from a long-forgotten TGIF sitcom, with Manny and his partner Ellie (Queen Latifah) raising their daughter Peaches (Keke Palmer) who’s getting married to the schlubby mammoth Julian (Adam DeVine), while Sid and Diego are put-upon uncle types on their own quests for love and what-not. However, when series icon Scrat’s never-ending quest to bury his nut ends up with him in outer space, he inadvertently sends a giant asteroid heading towards Earth, putting everyone in danger. Will the herd, including underground-dwelling weasel Buck (Simon Pegg), somehow find a way to avoid a planet-destroying collision? Has this series of films finally stopped trying to make wholesome entertainment? The answer to at least one of those questions is, yes. It’s a shame to see something like Ice Age resort to such bottom-of-the-barrel storytelling, where “jumping the shark” is a phrase that can’t even be used to fully describe it, because it did start out at a wholly decent place with those two first films, but it got progressively worse and worse with each new film. It’s clear that the only reason it’s still going, and why there’s even a fifth film in this franchise to begin with, is because they still make money, and nothing else. You can tell that almost everyone from the voice cast to the writers are here due to either contractual obligations or to milk this cow for all its worth, even long after it’s all dried up, instead of being there because they still actually have faith in this series. As the film continuously makes one giant leap in logic and coherency after another, combined with enough bum and fart jokes to melt the polar ice caps, you refuse to believe that these actors and writers have an ounce of caring left in their systems, because kids and their parents deserve much better these days than characters waving their arses in front of us. These characters too, once entertaining and even likable, have become mere cardboard impressions of themselves without any of the charm they carried when they were first introduced. For example, since becoming a father in the third film, Manny has gone from being a grumpy cynic to an overbearing parent with a plotline here that’s straight out of a rejected episode of Everybody Loves Raymond; meanwhile, Sid has become more of an obnoxious lisping comic relief with every passing film, and once again he’s saddled with Wanda Sykes who does nothing but spout sass out of her ancient grandmother character’s mouth; and Diego is just kind of there, with no real role in the story whatsoever except to complete the original trio from the first film. Even poor Scrat, who is usually the highlight of each Ice Age film, gets lesser material this time round, mostly spoiled by the film’s marketing (including the entire opening sequence which was presented as a short film in front of The Peanuts Movie, a far superior Blue Sky Studios film), and is somehow even more pointless than ever, even in the various and all-too-brief cutaways to his antics in space. They’re all so uninteresting by this point, that by the end you’ll be begging that asteroid to wipe them out. There’s no point going into any of the other characters be they old or new, because none of them barely even register as genuine characters other than walking stock stereotypes (actually, that’s a lie: Pegg’s Buck is the most entertaining out of all of them, from an impressive one-shot sequence wherein he saves a dinosaur egg whilst singing Figaro’s Aria onwards). Even though the animation is rather nice, the pretty colours fail to extend to these empty shells that once used to be entertaining characters in this different and fun family film series. Now, though, they’re just CG-rendered pawns used by lazy writers to act out uninspired slapstick and humour with the sole purpose of distracting your kids for an hour and a half, which if you look back at that first film you’ll realise that was not what it started out as. 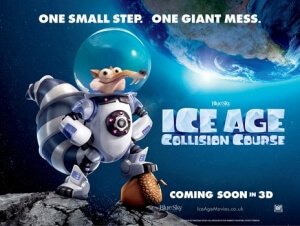 That ultimately makes Ice Age: Collision Course a rather sad example of a studio beating yet another dead horse, one that should finally be left alone to wither and die, or in this case melt. Ice Age: Collision Course shows just how the franchise has finally gone too far, now relying more on uninspired slapstick and bum jokes than actual story and characters, and when you can’t even get a solid laugh out of Scrat and his nut-related antics this time around, you know it’s finally time to retire this cash-cow franchise before things become too unbearable for the paying audience.